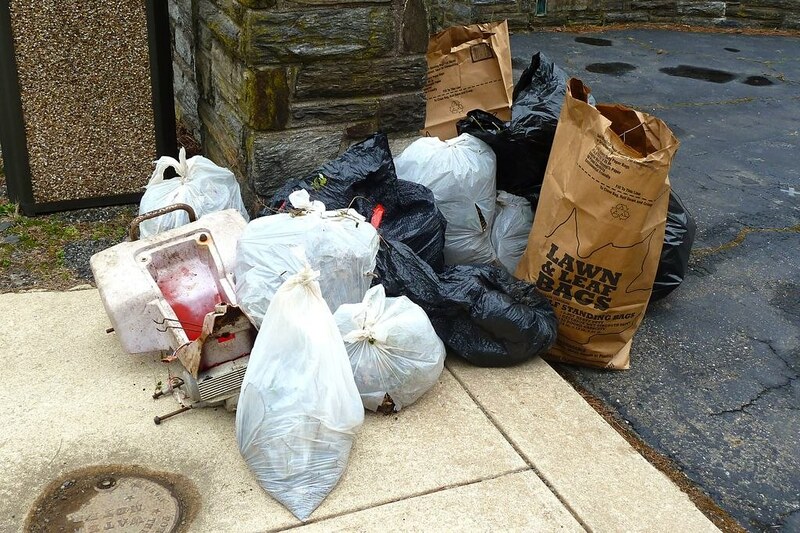 Home » Caretaking » Early Spring Cleaning! 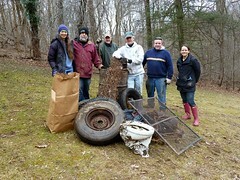 What a productive morning for our Early Spring Cleanup in Glen Providence Park! 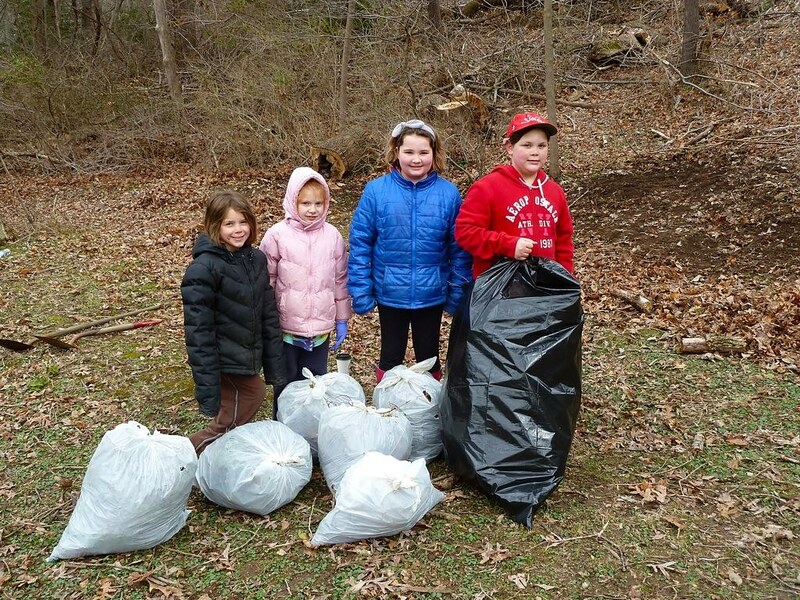 Thank you to the 19 volunteers (including Brownies from Troop# 5248) who came out on a cold morning last Sunday and helped us clear 9 bags of invasive plants, (at least) 3 bags of trash, and some interesting large trash: 4 tires (one whitewall! ), a grate, a cart, a rusted bike, a sleeping bag(! ), a toilet(!! ), a rusted 55 gallon drum, and a cyclone fence! 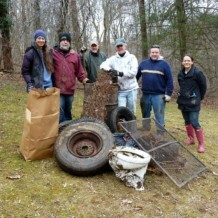 Some of that trash was really old (and in obscure places)– that whitewall tire was probably from the 50’s or 60’s! 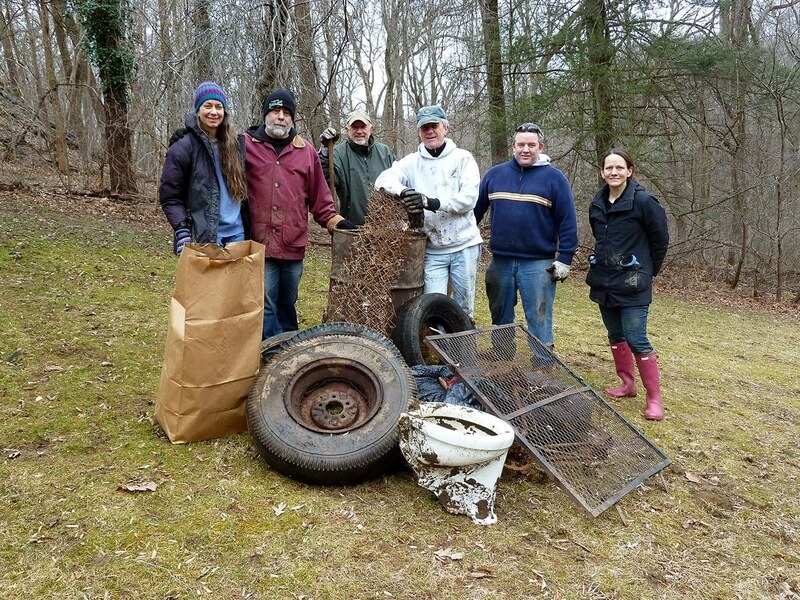 And there was some lingering industrial debris, half-buried, from the automotive shop and other businesses that used to be where the medical offices are now, above the Mountain Laurel Trail. We planned this park clean-up event for early spring, before the foliage makes trash harder to see and access. It proved to be a good strategy! We also managed to clear all but the largest branches that were backing up Broomall’s Run where a large fallen Sycamore was damming the creek and frequently flooding the Shingle Mill Trail. And we cleared off those stairs where the Shingle Mill Trail takes a u-turn. As always, we had fun while working, and in the cold weather we especially appreciated the Seven Stones coffee and pastries. 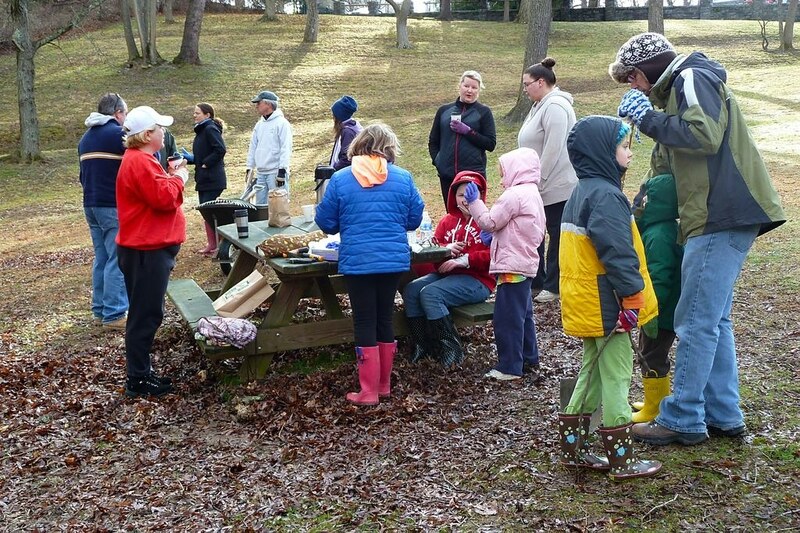 Thank you to our wonderful and tireless volunteers, with special thanks to the girls and moms from Brownie Troop #5248 who cleared invasive plants by the concert stage. 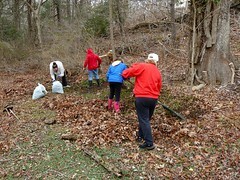 This was our first of three weekend volunteer days in 2013, in addition to regular Invasives Removal. Come join us for the CRC Watersheds Annual Streams Cleanup on May 4! 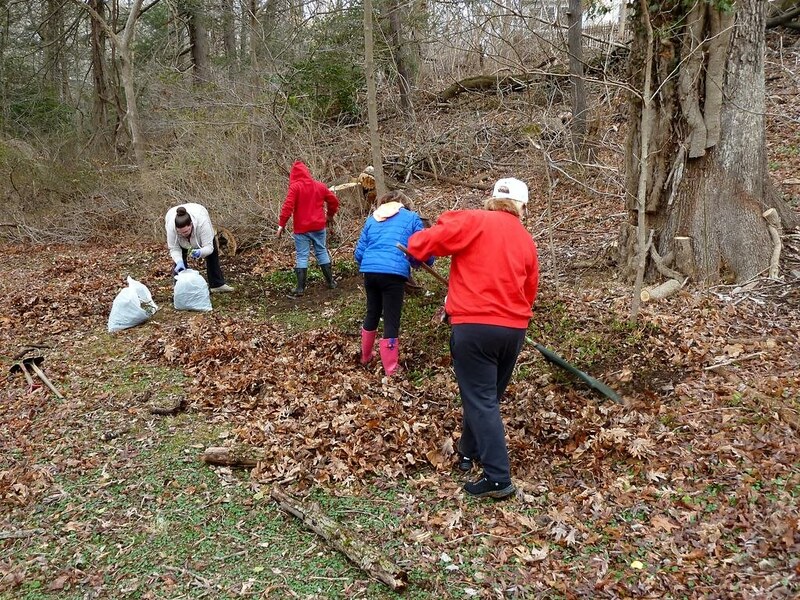 Check out our photos from our Early Spring Cleanup, hosted on our new flickr page! Brownie Troop# 5248 cleared all these invasive plants! 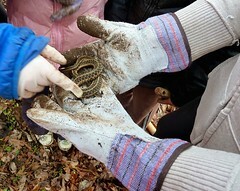 The Brownies gently admired this Common Garter Snake! I had a great time cleaning up and found some neat old items up by the iron springs. I am really excited to see what the Girl Scouts plant in May! One thing I noticed was the amount of plastic bags in the creek and from the road runoff drainpipes. It was shocking how many layers of plastic there was, and how it really snarled up the flow of parts of these streams. I am glad Media Borough put a dog waste receptacle near that park entrance! Also, there is so much trash dumped over the dam into the park. Mostly beer cans but also full bags of trash! Perhaps we can talk to the powers that be — Upper Providence, Delaware County — to put a trash can on the UP side of the dam for the time being to help slow down the dumping in the park.